The UN refugee body (UNHCR) estimates that, last year, 65.3 million people were forcibly displaced and up to 10 percent of them were people with disabilities. That is a reality that somehow has been lost in the sea of coverage of the ongoing devastating refugee crisis, and it’s a fact that the global community needs to deal together. People with disabilities are two to four 4 times more likely to die in a crisis situation than the rest of the population, says UNHCR. The hardships that refugees with disabilities and their families endure while fleeing conflicts or harassment are beyond belief — transit across borders on land, or in boats across the sea is often accompanied by physical suffering and loss of lives. Watch this story of one of them by the Human Rights Watch: a single mother with both of her children in wheelchairs, crossing borders from country to country, multiple times with her children packed into the pockets of the horse saddle for the duration of the journey. Such traveling conditions are even more unacceptable for persons with disabilities. Any stagnant seating over prolonged period of time with no opportunity for stretching may cause irreversible damage to persons with physical disabilities. More so traveling across the mountains in a pocket of a horse saddle over days-journey. Often, people with cerebral palsy and other physical disabilities may get permanent muscle damage from being overheated or when they are exposed to low temperatures. At the same time, people with seizure disorders may lose their lives from being too hot or too cold. Nevertheless, people who are desperately trying to seek safety, take this chance regardless of the danger. That choice is even more grim for families with disabilities and things do not necessarily get better even if they survived that journey. Lack of accommodations, education opportunities, and related services are reported across the refugee camps. Some people spend months in refugee camps with no access to occupational therapy, physical therapy or speech therapy. For a person with disabilities, such gaps in therapy may be irreversible and harmful according to this Human Rights Watch report. The United Nations Convention on the Rights of Persons with Disabilities protects access to education, health, habilitation and rehabilitation, as well as adequate standard of living and social protection. The international community needs to adopt measures to address the challenges facing refugees with disabilities, particularly while in transit or in refugee camps. International organizations, such as UNHCR and the International Rescue Committee are trying to mitigate these issues. UNHCR uses a Resettlement Assessment Tool: Refugees with Disabilities to identify persons with disabilities and their needs. Under the New York Declaration (2016), there is a Comprehensive Refugee Response Framework (CRRF), which provides an outline of specific actions for refugee-hosting countries and tools for addressing the needs of the refugees. In addition, UNHCR has proposed the Global Compact on Refugees for next year, which will serve as a framework for global refugee response and suggest actions for Member States to ensure implementation of these procedures. 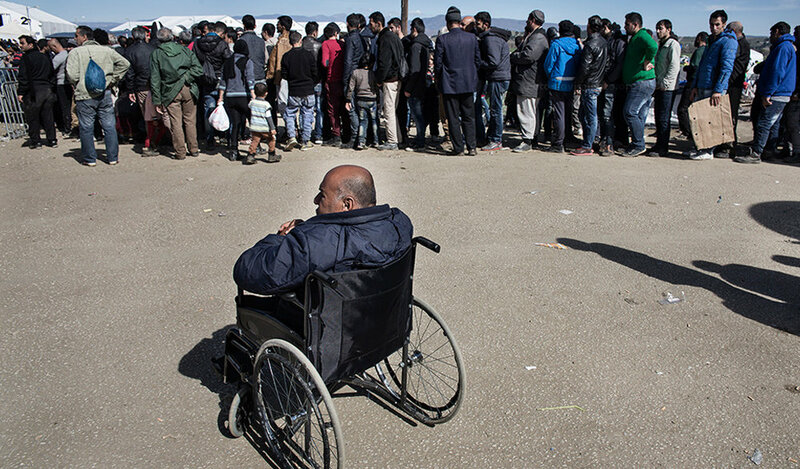 Meanwhile, the international community could help by bringing awareness to the needs of refugees with disabilities, advocating for their rights, as well as through supporting UNHCR and other international organizations financially. Mahatma Gandhi said, “A nation’s greatness is measured by how it treats its weakest members.” Global community should live up to this statement, for the greatness of our global community should be reflected through the ways we treat our weakest members-refugees with disabilities. Vera Dimoplon is a second-year graduate student at the Seton Hall School of Diplomacy and International Relations. Vera serves as a representative of the Center for United Nations and Global Governance Studies at the United Nations and specializes in International Organizations and Negotiations.